They don’t have commanders at all. …and I don’t mean by the US. If Tier One has an objective then it is perhaps their mission to change this often sad display of teamwork shown on the skirmish field. All the drills I have learned, at the two training days I have now attended, have been focussed – absolutely focussed – on teamwork. Making it natural, making it fit and making it flow like water going down a hill rather than gardening up one. Like I said, “Criticism is easy”. 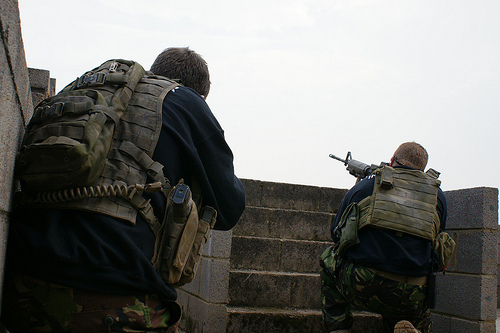 Before Christmas, team Delta Alpha visited Catterick for a Milsim game run by Stirling airsoft. The scenario was simple; one team were the Yanks, dropped into a favela and charged with capturing two gang leaders. The other team was the aforementioned gang and their objective was to annihilate the American presence. We played on the US side and we ordered to hold a house in a strategic location on the map and provide simple area denial. Taking the house took ten minutes, but since High Command couldn’t come up with anything else for us to do that wasn’t an ego fantasy on their part, we left the comms’ and went house storming. Now the DAs are not too bad at taking houses, indeed “door kicking” is our speciality as we all have had training from the Met Police fire arms unit SO19 (a benefit of having police officers in the team). However, it took many lives to achieve control of each house and moreover when were caught outside we got to bickering about “who should do what” and we were quickly surrounded and slaughtered. Since that day I have been trying to work out what went wrong. Thanks to this course I now know what went wrong, why I was a part of the failure and, even better, I know how to fix it. We arrived at Copehill Down FIBUA site, nestled in the hills surrounding Stone Henge in Wiltshire, at 9:30am. We were in a hurry as we had gone the wrong way and wanted to be “ready by ten” – it is very much our team ethos to not be the ones slowing the day down. As we pulled into the car park I could see all the Tier One boys had the same idea and they were all ready to rock on time as well. In their case this is probably due to the years of military discipline each possesses. Unfortunately we couldn’t get into the site for over an hour. This seriously held us up as the site had to be thoroughly checked for un-exploded ordinance (UXO). 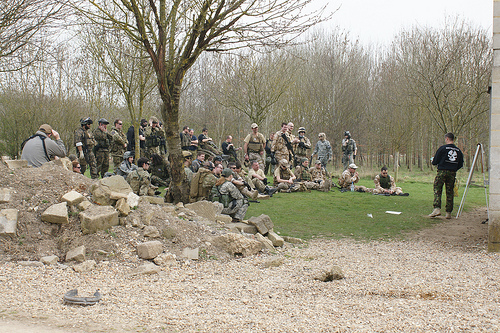 There were about 60 people in total, mostly regular players for the other organisation, and I could see that they were what I would call “skirmishers” more than Milsim players. No bad thing of course, airsoft is a game played by all sorts of people. When we finally got going we were first given an introduction into the Tier One instructors together with some funny images of their service history, which relaxed the audience for the short classroom session that followed. This, like in the previous woodland training, was excellently presented by Stewart, who had no problems dealing with the class size. 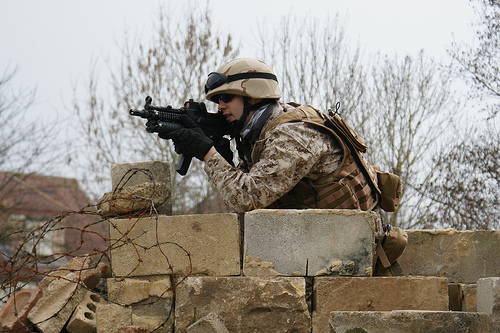 He started by showing us a short clip of the battle at the end of Saving Private Ryan, which he explained showed clearly how the advantage in a FIBUA assault was with the defenders and teamwork and tactics was the only way to prevail without enormous numerical superiority (something unlikely in airsoft). He then outlined the way the Commandos would capture Copehill. This explanation involved a birds-eye view of the site provided by Google Maps all highlighted and coloured as well as an outline of the stages of an assault and what to do in each stage. He also outlined how the team should be split up to achieve these objectives and how that provided for the best use of cover and support. One major difference from what I was used to was that most of the team is in a covering position with only one assault unit taking a room in the first house and the commanders feeding men into that “break in” point. Then we all went outside and he showed us the Tier One boys doing it for real. This really put it in perspective and his explanation vividly demonstrated how each unit worked and supported the others. 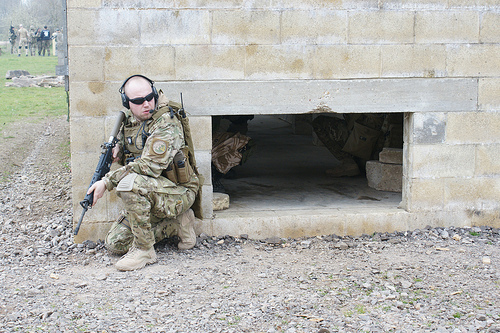 One of the major benefits of doing this training at Copehill is that the village is designed especially for the teaching of these very techniques and provides special “cut away” buildings to clearly show how to fight in a house. 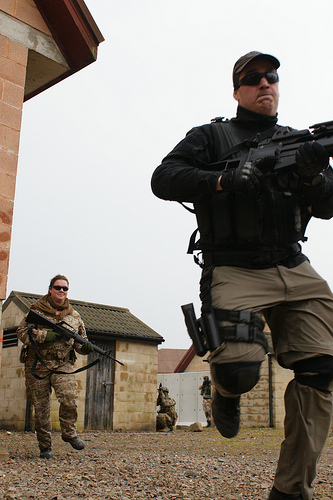 The Commando way of taking a house is cautiously, much more cautiously than most airsoft assaults I have been in, and I will be interested to put this training into practice when I next play in a FIBUA battle. Splitting into teams and then assigning roles, Team 1, Team 2, Cover Unit, Commander and Linkman, we drilled what we had learned under the watchful eye of the assigned Tier One instructor. After each run through he evaluated our performance and we switched the roles around and tried again. 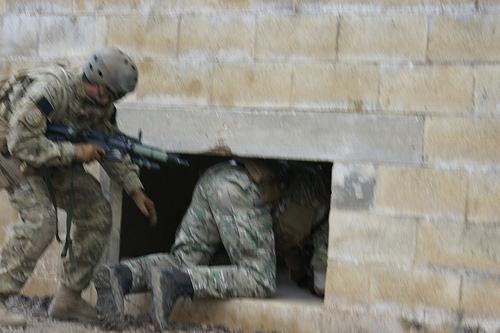 Stacking up outside doors in large groups is definitely out, and most of us were providing cover to the building before being moved up by the commander through the “linkman” role. We mostly attacked via windows and “mouse holes”. This was again new for me as I tend to avoid windows due to my size and have found that all the windows in a game will be defended. Inside the house we stayed in teams and moved through each other one corridor/room at a time, bursting into rooms as we went. Of course, the Commando way also includes a large amount of grenades used to clear each room and entering the room a split second later firing on full auto. In airsoft, this will often be expensive in grenade costs and full auto is mostly banned in houses, but Tier One has made the commitment to teach it as it really is. It is up to the player to fit the tactics to the potential rules of their site. Over six or seven attempts we actually started to work well as a team and there was lots of fun as we dived in windows and “fragged” rooms before bursting in and shooting up the targets. Given that most of the team had never played together before this was a real achievement. If only the “pick up” groups I had operated in during battles had been lucky enough to get this training I may have lived longer! Then it started raining in earnest, but that didn’t stop us from the final challenge of the day: a Hogan’s Alley run against the clock for prizes! I partnered with Mike and we were tasked with the clearing of one side of a street using the tactics we had learned in the day and being assessed by the Tier One instructor. Mike, who is our latest recruit to the DAs, is a natural airsofter and I was honoured to partner him through the challenge. Even the Instructor was impressed by his ability and he missed winning “player of the day” by a tiny margin (as I found out later in the pub). After the runs had all completed Tier One handed out the prizes, which included a hilarious moment when one player was tricked into thinking he had won a Gen-3 Night vision kit (worth £2000!) when in fact he had actually won something a lot better: The Fairburn-Sikes commando dagger is a classic of military design, but more than that it means a lot to the Marines who have had the honour of carrying it in the field. Its no-nonsense design and clean lines epitomizes the philosophy of the Commandos and the lucky guy being presented one was duly impressed (I heard he is going to mount it). After that it was pub time, a fun chat with the Tier One crew and the ladies & gents on the course. Then a 3 hour drive back to Essex carried out by the ever reliable Keith and his large estate car nicknamed “Red October”. We arrived back home around 3am and immediately went to bed. Since then I have had the odd twinge of soreness in the knees and these have reminded me of the day. 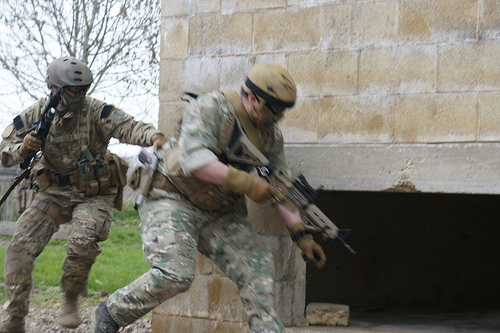 Tier One remain new to running airsoft events, but they are consummate professionals with a real fresh vision for the game. 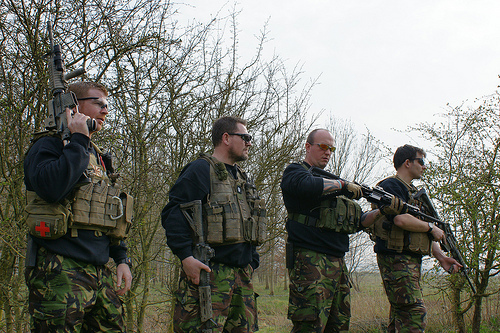 I have often talked (usually drunkenly) about the DAs starting up an airsoft company, but these guys are not just players; they are all experts in what they know and very good at passing it on. Overall, despite the delays, this makes the training of the highest quality and worth the investment. The first Tier One game is coming in just a weeks’ time and I personally can’t wait! 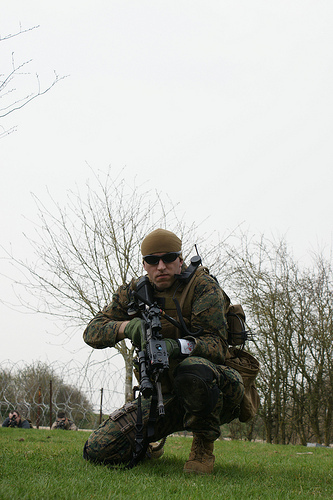 Tier 1 recently had a great game at Copehill Down, with high levels of RolePlay Milsim. I have written about this here.